Brojendra Agarwala, MD, is a well-known pediatric cardiologist with many years of experience treating infants and children with complex congenital heart disease. He has extensive knowledge of non-invasive diagnostic applications, including fetal echocardiography, for infants and children with heart disease. Dr. Agarwala has been named to Chicago magazine's list of Chicago's Top Doctors since 2004. He was named to U.S. News & World Report Top Doctors list for 2012. 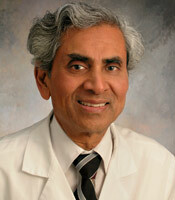 Brojendra N. Agarwala research interests include Pediatric cardiology Clinical and non-invasive testing.